Qualitest's Climatic chamber is designed to do high temperature & high humidity, high and low temperature, or temperature cycling test, Climatic chamber mainly used for quality checking and assessing their quality reliability and life test. The climatic chamber simulate a full range of temperature testing and humidity testing conditions.These chambers are designed for ease-of-use, reliability and performance and include many user-friendly features standard with your purchase for the best value in the industry. Climatic test chambers are able to provide rapid product temperature change rates and use varying levels of relative humidity to locate design problems prior to shipping your products, improving product quality and reliability. For conditioning of samples prior to testing. 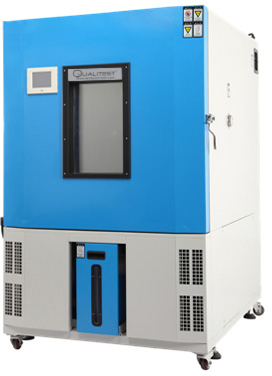 Climatic chamber also can be used for a variety of materials of high – low temperature alternating test. The test temperature, humidity, time can be programmed. Provides conditions of temperature form -70 degree to +150 degree and of humidity from 20% to 98%. This type climatic chamber use 16bit Industry-grade PLC, programmable controller to control the test temperature test, and recycle time, more excellent anti jamming, high reliability of the data. TEMI880 large color LCD touched screen temperature & humidity controller. Real-time display program running time, the number of segment, the remaining time, repeat frequency,can display experimental data, including the pre-set segment time, heating status, calendar time, etc; climatic chamber directly digital display. Climatic chambers apply controllable silicon step-less adjusting technology to adjust temperature and humidity test continuously and precisely, and without over heated as the PID adjusting function.